What this writer saw and experienced at Apapa on 24 June, 2015 is no more gridlock in the area. The gridlock has snowballed into chaos. If anyone is in doubt, such a person should visit Apapa after reading this piece. If he is a governor or a common man, he will either trek or drive against traffic. Otherwise, the person must use a boat through creeks or inland waterways and thereafter trek to his or her destination. Apapa is now in a state of chaos. Chaos is ‘the final state in a system’s movement away from order’. When a system or organization reaches that point, its component parts are manifest as turbulence, lacking in direction or meaning. With the chaos at Apapa occasioned by traffic jam and bad roads for more than one year, it is tempting to find out if the federal government that owns the Apapa and Tin Can Island Ports are insensitive to the disorderliness in this area of Lagos State, the ‘Centre of Excellence’. Recall that this column published a piece on 30 September, 2014 titled ‘The DNA of disorderliness’. This article is a cocktail of several national issues considered to be products of disorderliness and ineptitude in our society. That the gridlock in Apapa has degenerated to chaos after several meetings between government and stakeholders has left much to be desired about governance in the country. The economy of the nation and that of the state in particular is badly affected, the environment is degrading at an alarming rate while safety of lives and property is significantly compromised. 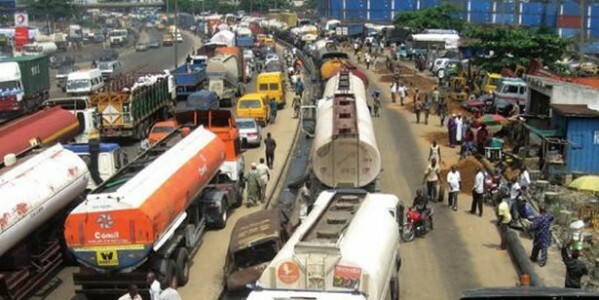 The economy, environment and safety components of development are under pressure as Apapa has fallen into chaos with a gridlock which persists for over 12 months despite various forms of intervention by stakeholders. The chaos presents problems of urban transit with attendant consequence on the economy, environment and safety of lives and property. Apapa is turned upside down with trailers and trucks breaking down and tipping daily on bad roads. Thus, business in this part of Lagos State cannot thrive on chaos. Apapa is one of the 774 local government areas in Nigeria with an estimated population of 217,362 (2006). Notwithstanding this doubtful population figure, Apapa is a major port city of Lagos located on the Island across the Lagos Harbour. Apapa has container terminals, several tank farms, commercial banks, shipping and customs clearing agencies, primary and secondary schools, as well as hotels. Besides, various military and police units as well as NIMASA and the Nigerian Shippers Council are located in Apapa. Report has it that there is an investment of more than $5 billion at the Apapa and Tin Can Island Ports respectively. There are several businesses and residential apartments in Apapa too numerous to state in this piece. Conservatively, investments in Apapa by my estimates are in trillions of naira. You only need to pay a visit to Apapa when the roads are free to traffic to appreciate the amount of investments in this area of Lagos. Apapa has a railway line (not working) that links other parts of Lagos State and the country. Regrettably, all roads linking the ports from the Apapa-Oshodi Expressway and Apapa-Ijora axis are in a state of disrepair. Due to the bad state of the roads, businesses are threatened. The rainy season has made matters worse as most roads are further degraded such that residents and those whose offices are in Apapa are now traumatized by perpetual traffic jam. Several heavy-duty trucks conveying goods to and from the ports are on the bridges for days. The consequence is that structural integrity of these bridges is impaired as they are not designed to carry these loads for a long period. This is because tankers from all parts of Nigeria are always stationed in Apapa struggling to lift petroleum products imported for use by the entire country. Petroleum products are discharged at the Atlas Cove Storage Jetty in Apapa. Other imported items at the ports to be carried are sugar, rice, chicken, toothpick, cement, fish, fairly-used cars, amongst others. With the ban on importation of some of these consumables, will the flow of traffic to the Apapa ports reduce? If the refineries are repaired, will the quantity of fuel imported reduce so that few tankers will need to come to Apapa? These questions are asked because residents cannot go to work and return home easily without going through the stress of traffic in Apapa. Those who have their offices in Apapa trek almost every day to office either from Ijora or from Coconut bus-stop on the Mile 2 axis. Consequently, there are countless losses in valuable man-hours including decline in businesses across the country. Most firms have closed their offices in Apapa and relocated to other parts of Lagos State. It is doubtful if the consequences and risks associated with the use of only Apapa port to bring in imported goods were thought through. Since 2014, several meetings have been held to break up Apapa gridlock but it appears that those in government have no solution. It is a show of shame, and it must be stressed that safety of Nigerians working and residing in Apapa is significantly compromised. A German-born political philosopher, Hannah Arendt (1906-1975), theorized that ‘the sad truth is that most evil is done by people who never make up their minds to be either good or evil’. Arendt during her lifetime believed firmly that meaningful action depends on careful thought. It is doubtful if critical thinking was allowed to determine the choice of only Apapa port as the point of distribution of petroleum products in the country. What about other ports? Where are the ‘thoughtful doers’ in our nation in this new era? The cycle of chaos in Apapa is very embarrassing and I write with the belief that those in authority are thinking about the best possible solution to the problem and are willing to take bold steps to repair the bad roads. Visits by the high and mighty alone will not solve the problem but action.